Background/aim: The purpose of this study was to investigate and compare the pharmacokinetic behavior and tissue distribution of paclitaxel, delivered as commercial preparation Taxol or through Span 40 niosomes, after intravenous injection to rats. Materials and methods: Paclitaxel-loaded Span 40 niosomes were prepared using the thin-film method. An HPLC method was developed and validated for paclitaxel determination in rat plasma and tissues. Results: The area under the curve value of the niosome-recipient group (3.22 ± 0.255 &mu;g h/mL) was significantly higher compared to that of the Taxol group (0.725 ± 0.163 &mu;g h/mL). The mean residence time and the elimination half-life of paclitaxel were 1.66 ± 0.133 h and 1.15 ± 0.085 h for Taxol administration, respectively. The elimination half-life (7.63 ± 0.380 h) and the mean residence time (11.0 ± 0.6 h) of paclitaxel were significantly increased, and a pronounced delay was observed in general excretion of paclitaxel from plasma (0.0925 ± 0.00490 h-1) after niosomal administration. The spleen was the main tissue that accumulated paclitaxel from both niosomes and Taxol. Conclusion: The findings of this study show that niosomal formulation might be a useful drug delivery system for intravenous administration of paclitaxel. Katragadda U, Fan W, Wang Y, Teng Q, Tan C. Combined delivery of paclitaxel and tanespimycin via micellar nanocarriers: pharmacokinetics, efficacy and metabolomic analysis. PLoS ONE 2013; 8: e58619. Jang SH, Wientjes MG, Au JLS. Enhancement of paclitaxel delivery to solid tumors by apoptosis-inducing pretreatment: effect of treatment schedule. J Pharmacol Exp Ther 2001; 296: 1035–1042. Gelderblom H, Verweij K, Nooter, K, Sparreboom A. Cremephor EL. The drawbacks and advantages of vehicle selection for drug formulation. Eur J Cancer 2001; 37: 1590– 1598. 4. Tuma RS. Improving paclitaxel delivery. Oncology Times 2003; 25: 51–52. Sezgin-Bayindir Z, Yuksel N. Characterization of niosomes prepared with various nonionic surfactants for paclitaxel oral delivery. J Pharm Sci 2010; 99: 2049–2060. Green MR, Manikhas GM, Orlov S, Afanasyev B, Makhson AM, Bhar P, Hawkins MJ. Abraxane®, a novel Cremophor®- free, albumin-bound particle form of paclitaxel for the treatment of advanced non-small-cell lung cancer. Ann Oncol 2006; 17: 1263–1268. 7. European Medicine Agency. Assessment Report for Abraxane. London, UK: EMEA; 2008. Zhang Z, Mei L, Feng SS. Paclitaxel drug delivery systems. Expert Opin Drug Deliv 2013; 10: 325–340. Kaudelka Š, Turánek J. Liposomal paclitaxel formulations. J Control Release 2012; 163: 322–334. Lim WT, Tan EH, Toh CK, Hee SW, Leong SS, Anq PC, Wong NS, Chowbay B. Phase I pharmacokinetic study of a weekly liposomal paclitaxel formulation (Genexol®-PM) in patients with solid tumors. Ann Oncol 2010; 21: 382–388. Yokoyama M. Clinical applications of polymeric micelle carrier systems in chemotherapy and image diagnosis of solid tumors. J Exp Clin Med 2011; 3: 151–158. Li C, Wallace S. Polymer-drug conjugates: recent development in clinical oncology. Adv Drug Deliv Rev 2008; 60: 886–898. Xu W, Lim SJ, Lee MK. Cellular uptake and antitumour activity of paclitaxel incorporated into trilaurin-based solid lipid nanoparticles in ovarian cancer. J Microencapsul 2013; 30: 755–761. He H, Chen S, Zhou J, Dou Y, Song L, Che L, Zhou X, Chen X, Jia Y, Zhang J et al. Cyclodextrin-derived pH-responsive nanoparticles for delivery of paclitaxel. Biomaterials 2013; 34: S344–S358. Lu J, Huang Y, Zhao W, Marquez RT, Meng X, Li J, Gao X, Venkataramanan R, Wang Z, Li S. PEG-derivatized embelin as a nanomicellar carrier for delivery of paclitaxel to breast and prostate cancers. Biomaterials 2013; 34: 1591–1600. Wang F, Shen Y, Xu X, Lv L, Li Y, Liu J, Li M, Guo A, Guo S, Jin F. Selective tissue distribution and long circulation endowed by paclitaxel loaded PEGylated poly(ε-caprolactone-co-L- lactide) micelles leading to improved anti-tumor effects and low systematic toxicity. Int J Pharm 2013; 456: 101–112. Gill KK, Kaddoumi A, Nazzal S. Mixed micelles of PEG2000- DSPE and vitamin-E TPGS for concurrent delivery of paclitaxel and parthenolide: Enhanced chemosensitization and antitumor efficacy against non-small cell lung cancer (NSCLC) cell lines. Eur J Pharm Sci 2012; 46: 64–71. Xiao K, Luo J, Fowler WL, Li Y, Lee JS, Xing L, Cheng RH, Wang L, Lam KS. A self-assembling nanoparticle for paclitaxel delivery in ovarian cancer. Biomaterials 2009; 30: 6006–6016. Teow HM, Zhou Z, Najlah M, Yusof SR, Abbott NJ, D’Emanuele A. Delivery of paclitaxel across cellular barriers using a dendrimer-based nanocarrier. Int J Pharm 2013; 441: 701–711. Uchegbu IF, Vyas SP. Non-ionic surfactant based vesicles (niosomes) in drug delivery. Int J Pharm 1998; 172: 33–70. Azeem A, Anwer MK, Talegaonkar S. Niosomes in sustained and targeted drug delivery: some recent advances. J Drug Target 2009; 17: 671–689. Wagh VD, Deshmukh OJ. Niosomes as ophthalmic drug delivery systems: a review. J Pharm Res 2010; 3: 1558–1563. Sezgin-Bayindir Z, Yuksel N. Investigation of formulation variables and excipient interaction on the production of niosomes. AAPS PharmSciTech 2012; 13: 826–835. Sezgin-Bayindir Z, Onay-Besikci A, Vural N, Yuksel N. Niosomes encapsulating paclitaxel for oral bioavailability enhancement: preparation, characterization, pharmacokinetics and biodistribution. J Microencapsul 2013; 30: 796–804. Food and Drug Administration. ICH Harmonised Tripartite Guideline. Validation of Analytical Procedures: Text and Methodology Q2 (R1) 2005. Bethesda, MD, USA: FDA; 2014. Food and Drug Administration Center for Drug Evaluation and Research. Guidance for Industry. Bioanalytical Method Validation. Bethesda, MD, USA: FDA; 2001. Savaşer A, Karatas A, Özkan Y, Yüksel N, Özkan SA, Baykara T. Validated LC determination of the piroxicam-β-cyclodextrin inclusion complex in tablets and in human plasma. Chromatographia 2004; 59: 555–560. Allen TM, Cullis PR. Liposomal drug delivery systems: from concept to clinical applications. Adv Drug Deliv Rev 2013; 65: 36–48. Storm G, Crommelin DJA. Liposomes: quo vadis? Pharm Sci Technol To 1998; 1: 19–31. Rajera R, Naqpal K, Singh SK, Mishra DN. Niosomes: a controlled and novel drug delivery system. Biol Pharm Bull 2011; 34: 945–953. Bae YH, Park K. Targeted drug delivery to tumors: myths, reality and possibility. J Control Release 2011; 153: 198–205. Peer D, Karp JM, Hong S, Farokhzad OC, Margalit R, Langer R. Nanocarriers as an emerging platform for cancer therapy. Nature 2007; 2: 751–760. McDonald DM, Baluk P. Significance of blood vessel leakiness in cancer. Cancer Res 2002; 62: 5381–5385. Misra R, Acharya S, Sahoo K. Cancer nanotechnology: application of nanotechnology in cancer therapy. Drug Discov Today 2010; 15: 842–850. Shi B, Fang C, You MX, Hong MH, Pei YY. Stealth PEG- PHDCA niosomes: effects of chain length of PEG and particle size on niosomes surface properties, in vitro drug release, phagocytic uptake, in vivo pharmacokinetics and antitumor activity. J Pharm Sci 2006; 95: 1873–1887. Hong M, Zhu S, Jiang Y, Tanq G, Pei Y. Efficient tumor targeting of hydroxycamptothecin loaded PEGylated niosomes modified with transferrin. J Control Rel 2009; 133: 96–102. Uchegbu IF, Duncan R. Niosomes containing N-(2- hydroxypropyl) methacrylamide copolymer-doxorubicin (PK1): effect of method of preparation and choice of surfactant on niosome characteristics and a preliminary study of body distribution. Int J Pharm 1997; 155: 7–17. Tavano L, Vivacqua M, Carito V, Muzzalupo R, Caroleo MC, Nicoletta F. Doxorubicin loaded magneto-niosomes for targeted drug delivery. Colloid Surface B 2013; 102: 803–807. Muzzalupo R, Tavano L, La Mesa C. Alkyl glucopyranoside- based niosomes containing methotrexate for pharmaceutical applications: evaluation of physico-chemical and biological properties. Int J Pharm 2013; 458: 224–229. Paolino D, Cosco D, Muzzalupo R, Trapasso E, Picci N, Fresta M. Innovative bola-surfactant niosomes as topical delivery systems of 5-fluorouracil for the treatment of skin cancer. Int J Pharm 2008; 353: 233–242. Cosco D, Paolino D, Muzzalupo R, Celia C, Citraro R, Caponio D, Picci N, Fresta M. Novel PEG-coated niosomes based on bola-surfactant as drug carriers for 5-fluorouracil. Biomed Microdevices 2009; 11: 1115–1125. Gude RP, Jadhav MG, Rao SGA, Jagtap AG. Effects of niosomal cisplatin and combination of the same with theophylline and with activated macrophages in murine B16F10 melanoma model. Cancer Biother Radiopharm 2002; 17: 183–193. Yang H, Deng A, Zhang J, Wang J, Lu B. Preparation, characterization and anticancer therapeutic efficacy of cisplatin-loaded niosomes. J Microencapsul 2013; 30: 237–244. Gaikwad SY, Jaqtab AG, Ingle AD, Ra SG, Gude RP. Antimetastatic efficacy of niosomal pentoxifylline and its combination with activated macrophages in murine B16F10 melanoma model. Cancer Biother Radiopharm 2000; 15: 605– 615. ISNAD BAYINDIR, ZERRİN SEZGİN , BEŞİKCİ, ARZU , YÜKSEL, NİLÜFER . "Paclitaxel-loaded niosomes for intravenous administration: pharmacokineticsand tissue distribution in rats". 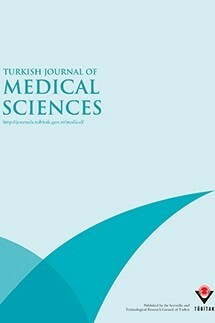 Turkish Journal of Medical Sciences 45 / 6 (December 2015): 1403-1412.